One of the biggest competitors to iOS users are the Android users. There are more Android activations than iOS activations, however, iPhone users generally are happier with their phone and are more likely to stay with their phones over a longer period of time. As an operating system, is less susceptible to malware and other viruses; however it does have some limitations. Fortunately, with the help of various developers and the advent of jailbreaking, the Cydia Store offers a lot of tweaks and apps to fill in some of the gaps that the Apple developers have left open. The app or tweak that we will discuss today is like so many of the tweaks created to make life easier for the iPhone user. This is a free app and can be found in the ModMyi Repository. You will need a device that has been jailbroken for it to run. 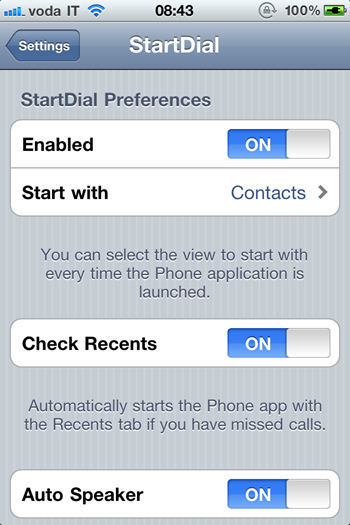 The purpose of the StartDial app is to allow the user to pick which segment they would like meet when they press the Phone icon. As an example, if you want to see the keypad when you open the Phone application, you can make the keypad the default screen when you launch the Phone app. You could make this the Contacts screen, the Favorites screen or the Recents screen. 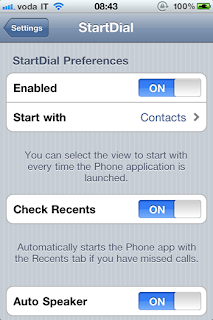 You can also get rid of the voicemail button if you want. Sometimes the use of this button can be annoying if you are using the phone with one hand. Again this is not a tweak that is especially fancy, however, it is nice in the sense that like so many of the tweaks, make your iPhone experience a little bit easier to handle. Considering that this app is free, it can’t hurt to go ahead and download it and just see how it works and also see if it makes operating your iPhone a little bit easier.